Is It Possible That They Actually Are As Healthy Now As They Look? 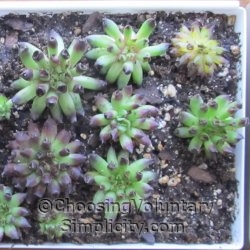 Home » Sempervivums (Hens & Chicks) / Simply Personal » Is It Possible That They Actually Are As Healthy Now As They Look? 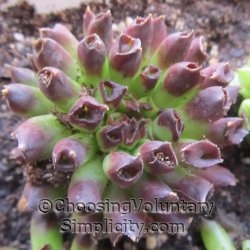 Late last winter I placed an online nursery order for fifty Oddity sempervivums… a variety of hens and chicks that have tube-like leaves and that… around here at least… are impossible to find. The plants I ordered were described as mature and I paid the extra fee for plants with a substantial root system. I also checked the little box that would delay delivery, chose a delivery date for sometime during the last week of May, and requested notification when the plants were shipped. The biggest of the remaining live plants… weren’t they pretty? That’s why it was quite a surprise to open the mailbox a couple of weeks later to find a small Priority Mail box with a huge “Live Plants Inside” label plastered on the front of the box. Inside were two small lunch-sized brown paper bags. The cardboard box was soggy… the bags were actually wet. The sempervivums were covered with what can only be described as mud. I spread the plants out and let them dry off for several hours before I attempted to brush off the mud that was packed into the crevices and inside the tubes. Seven of the plants were beyond saving… they had already become mushy and transparent. Some of the plants were absolutely beautiful… big plants with big beautifully-shaped maroon-tipped tubes. Unfortunately, most of the bigger plants had no roots at all. I would guess that only about a quarter of the plants had any kind of root system, and some of the “plants” were tiny offshoots. I just happened to have a bag of potting soil that was listed as being suitable for succulents and cactus… and several small trays that could house these sempervivums until they could be planted outdoors. As more of the mud dried I brushed it away with a small artist’s brush. Murphy’s Law was working overtime. These plants were delivered on a day when the temperature never rose above zero. The mail person forgot to leave the package when she delivered the mail in the morning and left it in our mailbox late that afternoon on her way back home. We had already collected our mail for the day and had no idea the package was in the box, so it stayed there until the next morning through a night of temperatures around twenty below. To further complicate the situation… the nursery shipped the package on a Thursday and it didn’t arrive here until the following Wednesday… which meant the plants were sealed in the bags covered in the wet soil for almost a full week. The first couple of days I was hopeful that the majority of the plants were going to survive their rough treatment… but every day one or two more of the plants would die. After a while I was convinced I was dealing with some sort of a plant disease, and I replanted the remaining sempervivums in individual cups and fresh soil in an attempt to isolate the dying plants from the ones that might still survive. By the time it was warm enough to plant them outside, there were only nine plants left. They spent the summer and fall in their own little garden, well away from my other sempervivums. So far I can only see the tips of the plants… but is it possible that they actually are as healthy now as they look? Poor little plants. I do hope they survive the winter. May they be as resilient as the one I planted last summer. The whole crown of the plant fell off when I dumped out of its pot for planting and not knowing what else to do, I just stuck it on top of the soil and plucked off the little chick it had to be planted elsewhere. Much to my surprise, it re-rooted itself and seems to be thriving. So pretty! 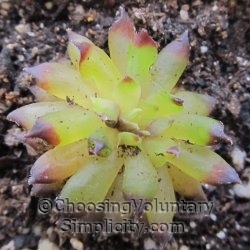 I’d like to have hens and chicks in my garden but I have alot of trouble finding them in nurseries around here (and I’ve *never* seen an oddity or any other unusual varieties locally). Maybe I ought to try ordering online, but if I do I hope I won’t have the troubles you had, though it really seems like that was caused by a combination of events that wouldn’t happen again. I hope your oddities live and thrive this coming season. I really enjoy your blog and especially your plant posts. I always look forward to your articles. I had kind of a similar thing happen with one order of plants. All the plants were mushy. I’ve had better experiences since then though. Love your succulent collection. I know that transparent look. I was gifted a neat little terrarium with 4 sempervivums inside. It was beautiful but the bottom leaves were transparent when I got it and within a short time all the plants were transparent. I know now the conditions in the terrarium were too wet when I got it. Too bad, it was so pretty.